Athletes, coaches, journalists, photographers and a government minister have all fallen victim to thefts. 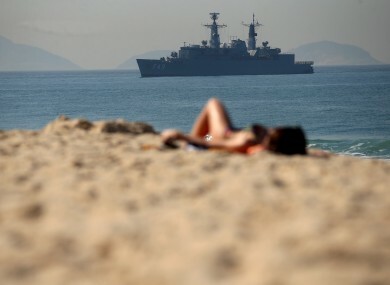 Sunbathers relax on the Copacabana beach as the Brazilian navy provides security at sea at the Olympic Games in Rio de Janeiro. IN THE CHAOTIC world of Rio criminality, an old trick is winning the gold medal. A blonde woman distracts the victim while an accomplice grabs the bag of cameras, computers or valuables. A second partner in crime sends the victim the wrong way if he or she gives chase. This textbook larceny is being played out each day on the beachside cafes along Ipanema. Pickpockets also ply Copacabana and there is also a more dangerous version. Sometimes the attacker just takes out a knife and puts it to the throat of his victim. Around the Olympics, thefts and muggings have become the talk of the town. A government minister, athletes and coaches and press photographers have all fallen victim. The danger lurks from the Rio media village to stadiums, and the cafes on the upscale seafront Ipanema district. The ‘Cariocas’, as the inhabitants of Rio are known, have long got used to the threat of crime, whether theft or murderous muggings. It has been a shock to the influx of Olympic visitors – and the government estimates that 500,000 people will visit Brazil over the course of the Games. Even on the night of the opening ceremony, two people were fatally shot near the Maracana stadium where it was held. Australian photographer Brett Costello is one of a growing press band to have suffered. The News Corp journalist lost tens of thousands of dollars worth of equipment in an Ipanema coffee shop – and then saw the thief two days later wearing his Olympic jacket with accreditation number. “I knew my number, you know, the vests have the number,” he told The Australian newspaper. If a guy walks in with a jacket that’s stolen from me two days before, there’s got to be something going on, don’t you reckon? Security video of the theft showed he was caught in the blonde woman sting. The Agence France-Presse (AFP) news agency, which has 700 square metres (7,500 sq feet) for its 180 accredited Olympic staff in Rio, has suffered several thefts. Security film has shown a man and a woman leaving the office pulling a case full of lenses and an official photographer’s jacket. “There is a security problem,” said Eric Baradat, AFP’s photo chief at the Games. Some people get onto the sites and into official buses without accreditation. The troubles have also hit the athletes’ village. Chinese 110m hurdler Shi Dongpeng lost his laptop computer to another well-planned theft. A man vomited on Shi and was chased by a Chinese journalist who was with Shi who went to the restroom. When he returned his belongings had disappeared. “Losing money now may avoid me bigger problems in the future,” Shi commented. The Danish delegation in the athletes village say it has lost telephones, tablet computers and even sheets. Portugal’s Education Minister Tiago Brandao Rodrigues was held up at knifepoint on Saturday in Ipanema, according to Portuguese media. The Extra daily newspaper said the minister was forced to hand over his money, telephone and bag. Rio is notorious for its crime. There were 3,000 violent deaths in Rio state – with its huge wealth gap – in the first half of the year. A fifth of Rio’s population live in favela slums. But the International Olympic Committee says it has no regrets about awarding the Games to Rio. “On the streets these things do happen unfortunately and it’s terrible,” said IOC spokesman Mark Adams. It’s important that the Olympics isn’t just a little European or American club, it needs to be spread around the world. Email “Rio Olympics: Thieves are using old tricks to steal from tourists ”. Feedback on “Rio Olympics: Thieves are using old tricks to steal from tourists ”.